Are you interested in getting a little fresh air and tasting a little craft beer along the way? Well Vancouver Brewery Tours has just announced a new tour that combines these two things perfectly, the Walking Tour of Brewery Creek. This area of Vancouver plays host to some great up-and-coming breweries and at the turn of the century, was in fact a vibrant local brewery scene. It now is home to Main Street Brewing, Brassneck Brewery and many others. You can now explore this area on a guided tour which starts off at CRAFT Beer Market in the heart of the Olympic Village. 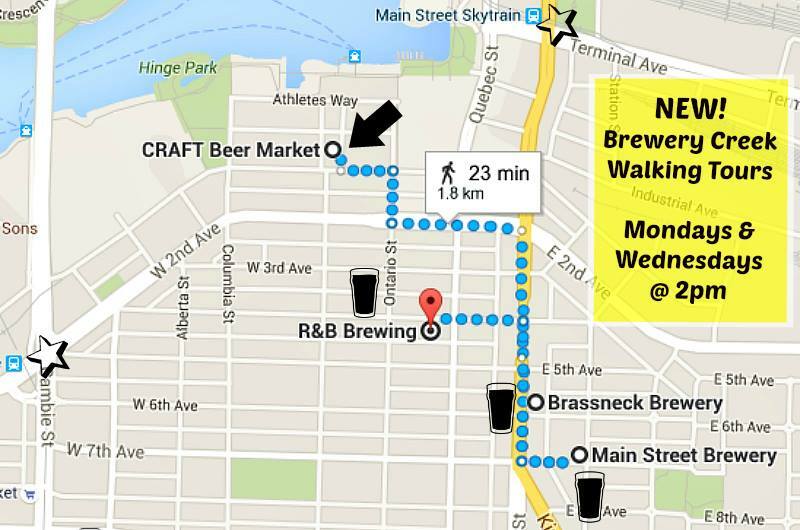 From there, you will walk to Main Street Brewing, Brassneck Brewery and R&B Brewing (soon be R&B Pizza and Alehouse). The tour will take approximately 3 ½ hours and will include 3 behind the scenes brewery tours with some very knowledgeable tour guides and well, of course, beer tastings. The tours will run on Monday and Wednesday afternoons at 2:00 pm at a cost of $65. You can reserve your seat online anytime, just visit Vancouver Brewery Tours. Cheers! 100 in 1 Day is happening in Vancouver this Saturday, June 6th. The idea is to bring hundreds of people together on ONE day and each take one small action to improve their city. This is in fact a global festival of civic engagement returning to Metro Vancouver for its second year. Organizers are encouraging small initiatives to spark change. Everyone is invited to come out and participate. And really, the beginning of any journey, just takes that first step, then another and so on. We’ve set out a listing of the events happening in East Vancouver, but if you’d like to see the full listing of events, visit 100 In 1 Day Vancouver. This event is hosted by the ProVibers. They would like to see a happy and more connected Vancouver so they are hosting a community potluck in Victoria Park from 6:00 pm – 9:00 pm on Saturday, June 6th. You are invited to bring food for the potluck, music, games and an openness to meet new people. Their aim is to build community connections in our neighbourhood. This event is hosted by the Grandview Woodland Food Connection. Organizers of this event would like people to experience the magic of eating fresh healthy food picked straight from the garden. Organizers invite community residents to come and enjoy the simplicity of eating a freshly picked salad together. The site is the beautiful Britannia School Garden which is abundant with fresh greens. You will pick veggies for a salad, prepare a healthy salad dressing and savor the taste of eating a fresh salad. While doing this, you will meet people in your community who are passionate about urban sustainability. This event begins at 1:00 pm and runs till 3:00 pm on June 6th. All you need bring if you wish, is a picnic blanket, the rest is provided. This event is hosted by Christine Nguyen and Eimon Yin. They are looking to connect spaces and people in the Kensington-Cedar Cottage community. They will be hosting a one hour walking tour highlight the diversity of history, culture and interesting stories that abound in the very places we live and play but often forget to appreciate. There will be two tours offered. One begins in front of Cedar Cottage Neighbourhood House at 9:00 am. The second tour starts at the SouthEast corner of East Broadway & Victoria Drive at 10:30 a.m. As each tour has limited spaces available, you are asked to sign up at Eventbrite. This event is hosted by Sarah Green. What do you love about your city, community or neighbours? You are invited to come hang out and through conversation or typewritten notes share information about your community. At this event, you will be seated in a mini-lounge where people can come and relax, sit for a moment and maybe meet a neighbor. You will be invited to use a typewriter or write a short love note about your current or future community. Sarah hopes to highlight where people find value in their surroundings, build connections and share information. James Johnstone is back with his historical walking tours and will be kicking off his first tour this Saturday, February 21st. James will take you on a tour of one of Vancouver’s oldest neighbourhoods, Strathcona. The tour kicks off at 10:00 a.m. starting from 696 East Hastings at Heatley. 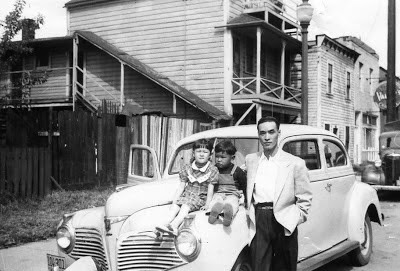 This historical walking tour is a culmination of years of researching over 250 homes in the East End. Although you will find architecture is a theme on this tour, James will also focus on social history and how waves of immigrants established themselves in this area before moving on to other parts of the city. The tour will also touch on the impact of portside industries like BC Sugar, the prohibition and the proliferation of bootlegging as well as the City of Vancouver’s attempts to wipe out “urban blight”. Join James this Saturday and he will tell you why Vancouver’s first neighbourhood is also its most fascinating. The cost of the tour is $20 per person. If you are unable to attend this weekend’s tour, James will be repeating this tour on February 28th, March 7th, March 14th and March 21st. If you would like more information or to reserve your spot, email James directly at historywalks@gmail.com. Looking for some fun things to do over the long weekend in East Vancouver? 1. Powell Street Festival, Oppenheimer Park, Sat. & Sun. 11:30 a.m. – 7:00 p.m.
3. Historical Walking Tour, James Johnstone, Strathcona, Sat. 10:00 a.m.
4. ‘Fat Dave’ Johnston & The Fuzz Kings, Falconetti’s, Fri. 10:00 p.m.
5. Back To The Future, Rio Theatre, Fri. 11:00 p.m.
6. Trout Lake Farmers Market, Sat. 9:00 a.m. – 2:00 p.m.
8. Streetfight: An Improv Battle, Havana Theatre, Sun. 8:00 p.m.
9. Hey Loser at Hot Art Wet City Gallery, Fri & Sat Noon – 5:00 p.m.